Gruner Veltliner is a mysterious grape to some. Many have developed the notion that Grüner is a mono-variety offering notes of white pepper, citrus and green apples, but the truth is that Grüner Veltliner is so much more. A recent seminar by importer, Winebow, focused on revealing these differences to a select group of industry folk in NYC and Washington, DC. last month with a panel discussion of different members in each city. In New York, where we were lucky enough to snag a seat, Aldo Sohm, Jesse Becker, MS, and Christy Canterbury, MW, sat on the panel moderated by Melissa Sutherland. A second portion of seminar focused on the Kremstal and Kamptal regions of Austria, leading with the thought that while the Wachau is one of the best, if not the best known regions of Austria, that the neighboring regions still have a lot to offer. This flight also focused on showcasing Austria’s DAC classified wines which led into the final discussion. Here, reds were also introduced as well as the newest DAC classified wine, Wiener Gemischter Satz. Winebow’s seminar, followed by walk around tasting, featured since from Szigeti, to start, Loimer, Stadt Krems, Prager, Paul Achs, Wieninger, Rudi Pichler, and Heinrich, all of which are excellent examples of great wine from Austria and have a long, successful history. For this reason, the seminar was attended by some of NYC’s top sommeliers and most attendees left with more questions than which they came… in a good way! So what is the future of Gruner Veltliner? One can never be too positive, but we are certain it is here to stay. 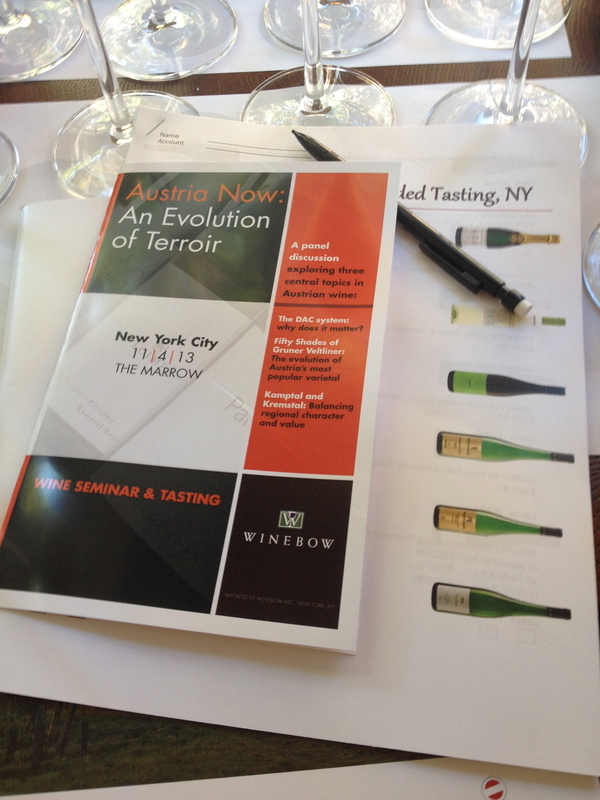 I did not realize that Winebow had such a broad Austrian portfolio–sounds like a great seminar!